Good farm hygiene and animal health practices can greatly reduce the need to use antimicrobial medicines. “Antimicrobial medicines play a critical role in the treatment of diseases of farm animals and plants. Their use is essential to food security, to our well-being, and to animal welfare,” said the UN Food and Agricultural Organization (FAO) in a news release. “However, the misuse of these drugs, associated with the emergence and spread of antimicrobial-resistant micro-organisms, places everyone at great risk,” it added. According to the agency, its Action Plan on Antimicrobial Resistance will focus on improving awareness of antimicrobial resistance (AMR) issues among farmers, veterinary professionals, authorities, policymakers and food consumers. The Plan will also focus building national capacities for surveillance and monitoring of AMR and antimicrobial use (AMU) in food and agriculture, strengthen governance related to AMU and AMR in food and agriculture, and promote good practices and the prudent use of antimicrobials in these systems. Globally, the use of antimicrobial substances has grown steadily over the past 50 years as animal and fish farmers increasing use these medicines are used to treat diseases, or to prevent them from spreading further. In some cases – albeit to a lesser degree – antimicrobial substances are spread on plant crops. To cope with the challenges of AMR, the UN agricultural agency underlined the importance of reducing the need for antimicrobial medicines in the first place, such as through vaccinating farm animals to build their natural ability to withstand disease. It also stressed that by adhering to best practices for hygiene, biosecurity, and animal care and handling, farms can minimise outbreaks and spread of diseases. “Another key need is the lack of a global, standardized approach to data used to track the use of antimicrobials in livestock,” said FAO in the release, referring to a report by the UK Government's O'Neill commission which found that only 42 countries have such systems in place. 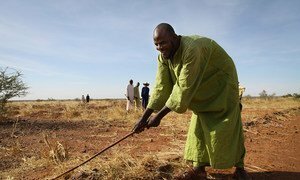 “Risks from AMR in agriculture are higher in countries where laws, regulations and monitoring systems are weak,” the agency noted. On its ongoing work, FAO also mentioned that the joint FAO-World Health Organization (WHO) Codex Alimentarius Commission, which sets international food quality and safety standards, has already laid the foundations for food safety control authorities to tackle AMR in food via a range of standards on AMR, veterinary drugs and their residues, food hygiene, and animal feed. Codex recently established a dedicated AMR task force. In the release, FAO also mentioned that the launch of the Action Plan is particularly timely given that the risk to human health posed by AMR as well as its connection to and impact on agriculture will be discussed at a high-level UN event to be held on 21 September in New York on the side-lines of the General Assembly.